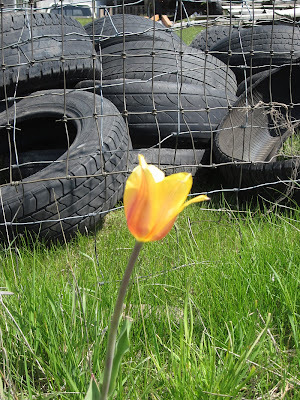 Thanks to Patrice Lewis at Rural Revolution for this description of her family’s tire garden. Great pictures included! 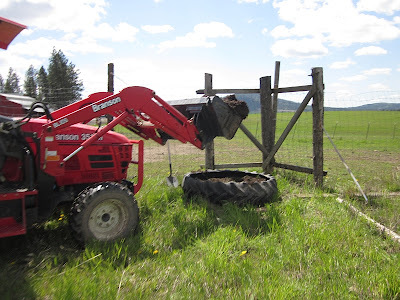 We’ve lived in north Idaho for nearly nine years now, and it’s worth noting that we’ve never had a successful garden. One year we had a pretty good one, but I wouldn’t classify it as great. And that was just one year. Gardening in our area is tough. 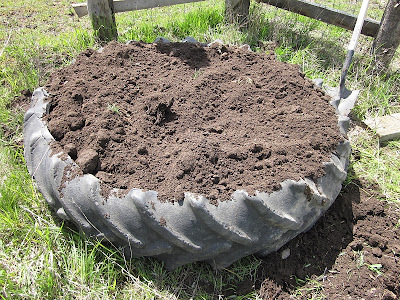 If it’s not the heavy clay soil, it’s the boggy spring conditions, the weeds, the short growing season, the deer, the voles, or even the grasshoppers. In short, the odds are against us. It’s not that we haven’t tried. 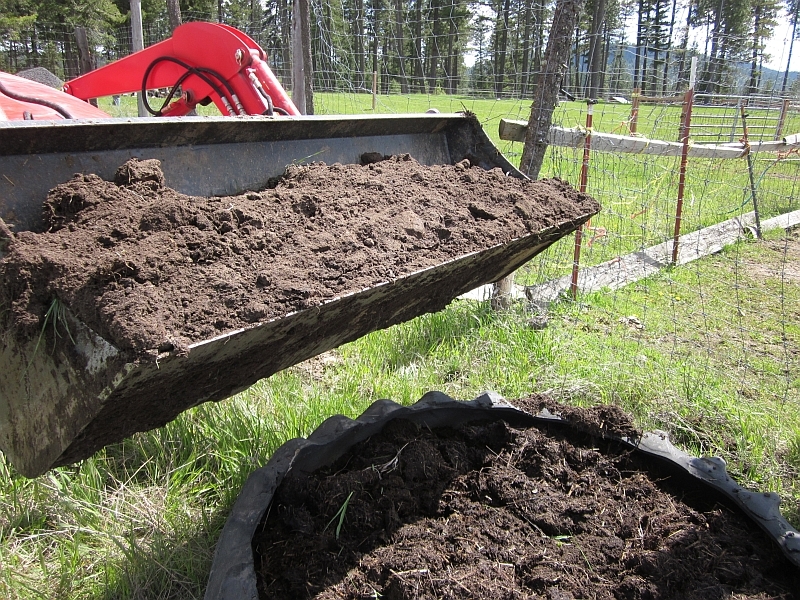 We’ve plowed endless amounts of composted manure into the soil in an effort to improve it. 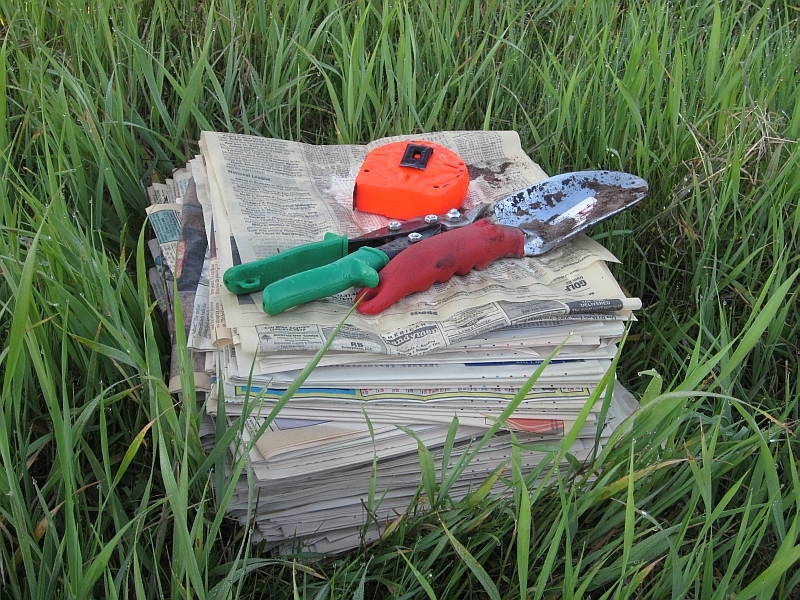 It hardly made a difference since we were still competing with the other issues (boggy spring rains, deer, etc.). Last year we finally gave in and made four raised beds for our small fruits (raspberries, blueberries, strawberries), which makes perfect sense. 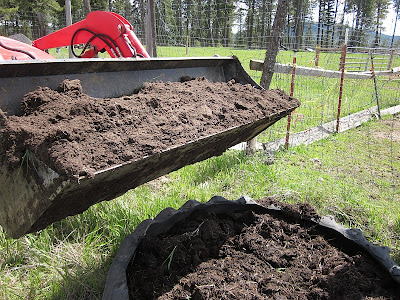 Raised beds mean the soil drains better, warms up sooner in the season, and the beds can be netted against deer as well as meshed on the bottom against voles. In short, raised beds seemed like the perfect solution. With materials we had on hand, we made those four beds for the small fruits, and what a difference it’s made! 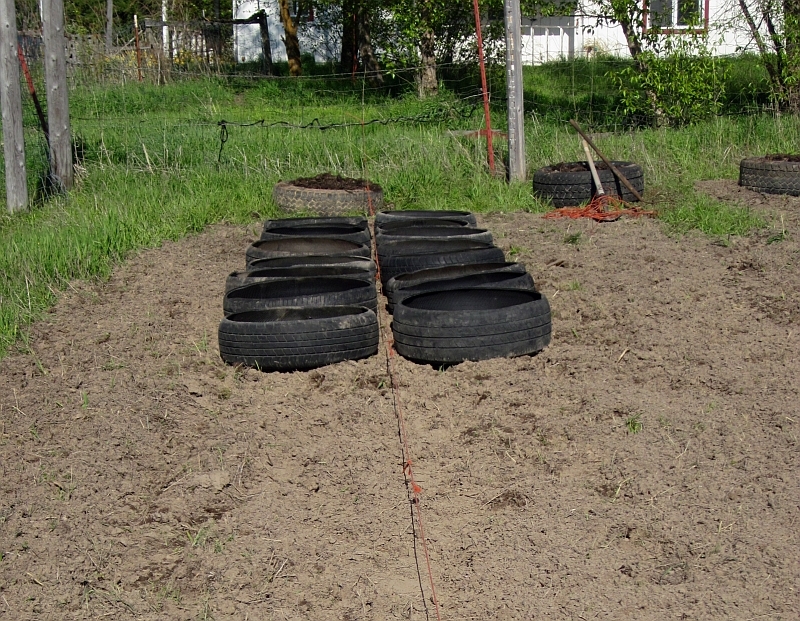 But we were stymied with repeating this process for vegetables, because we’d need lots more raised beds. 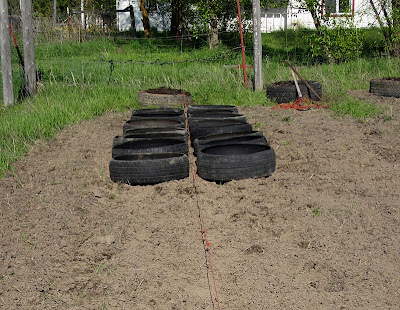 As in, lots and lots and lots, in order to grow enough veggies to keep us reasonably self-sufficient in produce. The problem wasn’t space — we’re blessed with plenty of that. 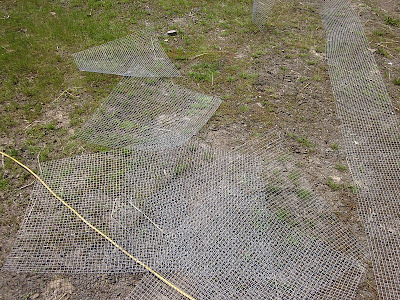 The problem was materials to build the beds (and a lack of money to spend on said materials). We are fortunate to have a decent stockpile of boards and beams from an old barn we disassembled many years ago — but even that supply of wood was limited and we didn’t want to use it ALL on raised beds for the garden because it would leave us without wood for other projects. So one day about a month ago — God alone knows why it took us so long to reach such an obvious conclusion — we decided to try tire gardening. It was one of those head-clunk “duh!” why-didn’t-we-think-of-that-sooner moments. The more we thought about it, the better an idea it seemed. 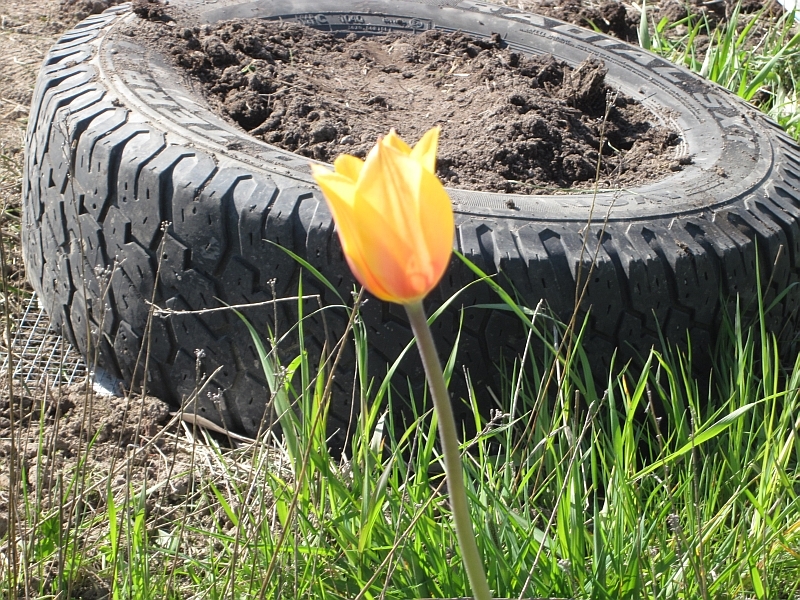 Tires are tough to the point of indestructible, they’re free, they’re black (the better for absorbing sunlight and warming the soil earlier in the season), and they’re abundant. And my goodness, they’re everywhere! 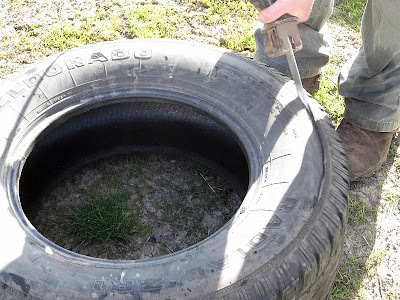 We started asking around gas stations and auto repair places and other potential sources, then nearly staggered back as the owners practically shoveled all their old tires in our direction. 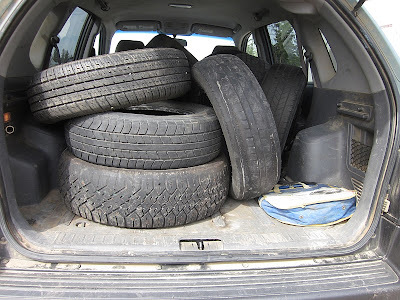 We also have a friend named Jack who works at Les Schwab (a regional chain of tire centers), and about once a week he loads about thirty old tires onto the back of his truck and delivers it to our place, and we compensate him for his time and gas. We’ve paced off our garden spaces, and potentially we have room for about 550 tires! (Obviously it will take awhile to work up to that.) 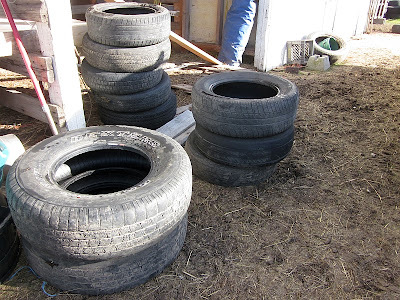 There’s a lot of garden space inside that many tires. We learned a thing or two, especially from Jack. 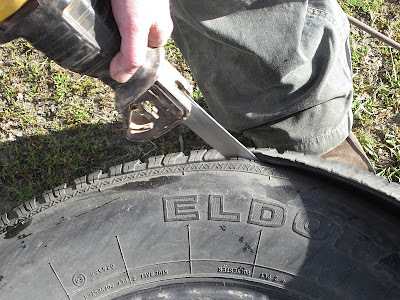 Don’t get steel-belted radials, he told us, because the steel extends into the sidewalls and we wouldn’t be able to cut through it. 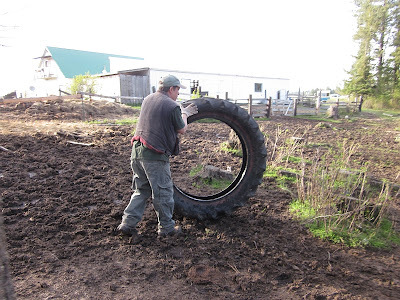 We also learned that, aside from the occasional giganto tractor tire (what a treasure! 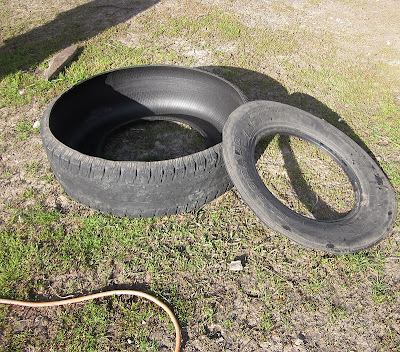 ), tires can be roughly divvied up into three sizes: small, medium, and large. “Like cutting butter,” Don said. We’ll have to figure out some function for the cut-out sidewall pieces. Meanwhile we started putting out word with friends that we’re on the lookout for old tires. 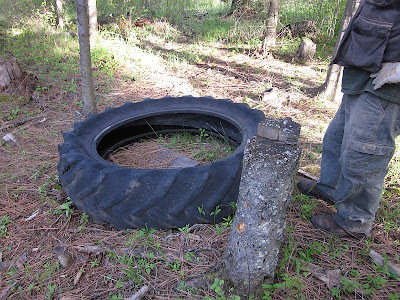 Our neighbor told us he had an old tractor tire down in his woods that his grandkids used to use as a fort. We were welcome to take it. Tires like this are a bonus. Here in farming country it won’t be hard to find them — we just have to put out the word. But tractor tires, being so big, are harder to fill. While we’ll welcome a few such tires, the smaller ones are easier to handle. In fact, we used the tractor to fill the tractor tire, layering soil and lots of composted manure. 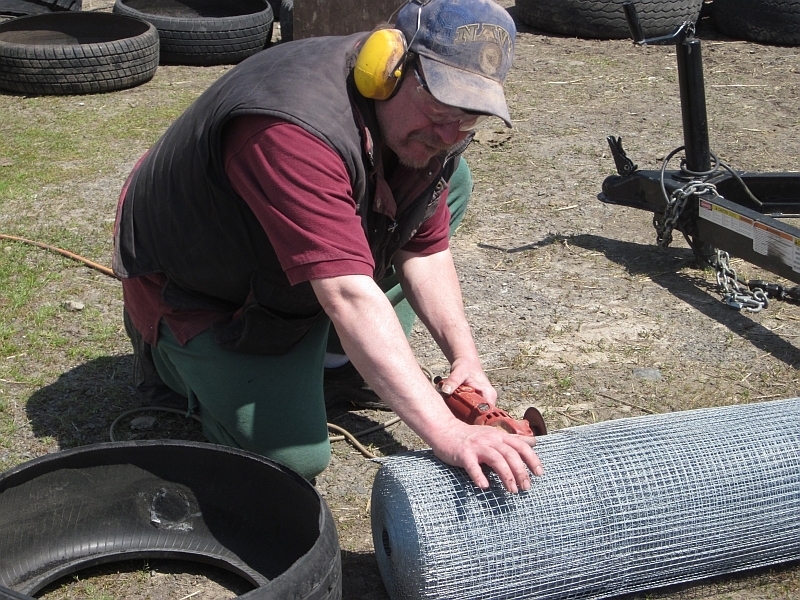 So before we lay down a tire, we’re putting down a thick layer of newspapers, then anchoring them with mesh hardware cloth. Here Don’s cutting the hardware cloth. The hardware cloth (which we bought last year) comes in three-foot-wide rolls. We need strips two feet wide to go under the regular (not tractor) tires. 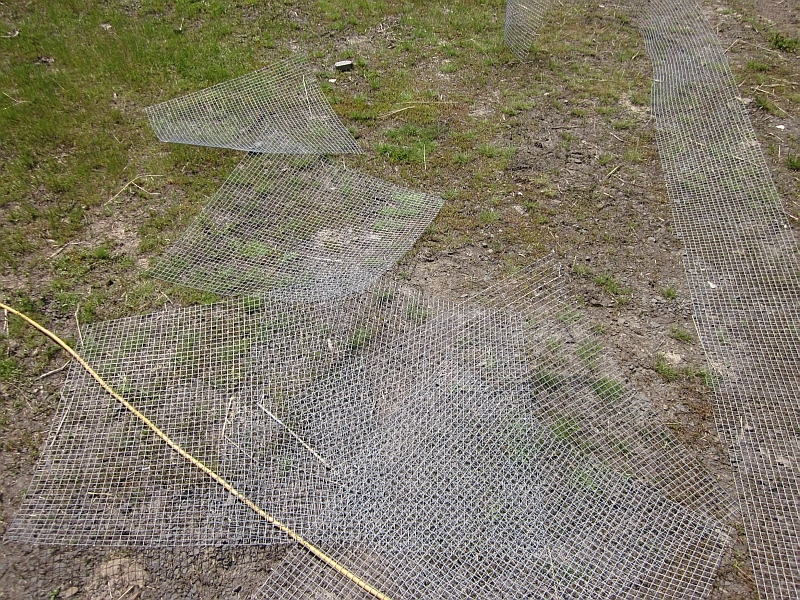 The long strip of one-foot-wide wire we cut up and lay two pieces together. Can’t waste this stuff, it’s too expensive. Newspapers. Lots and lots of newspapers. I estimate I’ll be going through stacks twelve or fifteen feet high. I’m soliciting newspapers from all our friends. I’m trying to lay everything out as tidy and neat as possible, since the location of the tires (once filled) will be more or less permanent. (And, not incidentally, since I’m hoping to write some future magazine articles on this project, it doesn’t hurt to have the end result as photogenic as possible.) 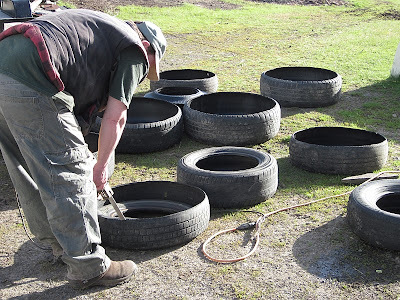 Don also plans to run drip irrigation hoses among the rows of tires, so keeping everything in nice rows will help with that aspect. 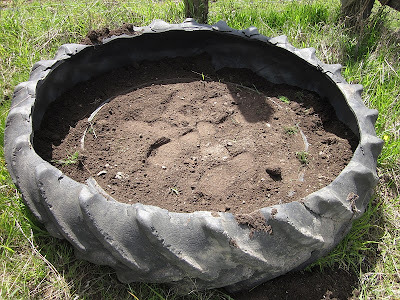 The only thing I’ve planted so far is potatoes (which I’ll write as a separate blog post) since we’re still in the process of acquiring tires, cutting up tires, laying out tires, etc. Our warm weather is holding (unusual) so we may take chances and plant some of the cool-loving plants soon, such as broccoli and peas. It would be far too expensive to keep ordering topsoil (we bought a load last year for the berry beds), so we’re going to use our own stuff heavily amended with composted manure, and see what happens. This is an unfolding project and I’ll be documenting it as I go. But I’m so excited about its potential! I’m babbling about it to anyone who will listen. Maybe I’m just setting myself up for failure once more — God knows it’s happened before — but at least we’re tipping the odds of a successful garden in our favor this time. 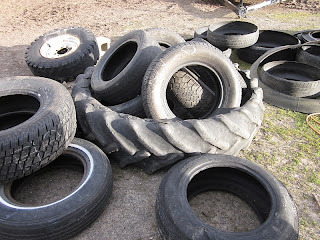 And, as a side bonus, we’ll eventually be keeping about 550 tires and a fifteen-foot stack of newspapers out of the landfill. Whoo-hoo!